Concrete handsaws are light weight hydraulic, gas, or electric powered saws and are small enough to be used where larger saws cannot fit. 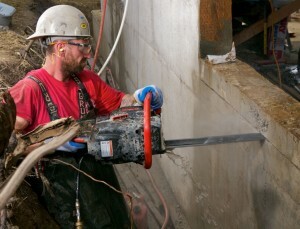 Hand sawing provides portability, speed and accessibility on construction jobsites. 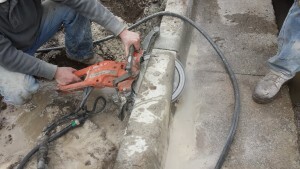 The hand saw safely and efficiently cuts concrete, concrete pipes, manholes, hollow or filled brick and block, and much more. These saws can be used to cut flush with existing floors and walls, and to create window, door and mechanical openings. It is particularly useful for inside projects with limited working space. If you need small HVAC openings where a wall saw may not be suitable, or floor and wall openings without any over cuts, then a diamond chain saw in conjunction with other hand saws is the best way for our technicians to save the integrity of the slab or wall that is to remain untouched. It is also more cost effective for some projects than other methods. Chain sawing is also beneficial for openings that a standard saw is too large to fit. The chainsaw is a specialized hand held saw that lets you cut openings in masonry or concrete structures without overcuts. Our professionally trained and OSHA certified operators can make penetrations through concrete structures, resulting in square corners, eliminating over-cuts and reducing patchwork. The Chainsaw is a “plunge cut” capable saw that is able to cut depths up to 24”. 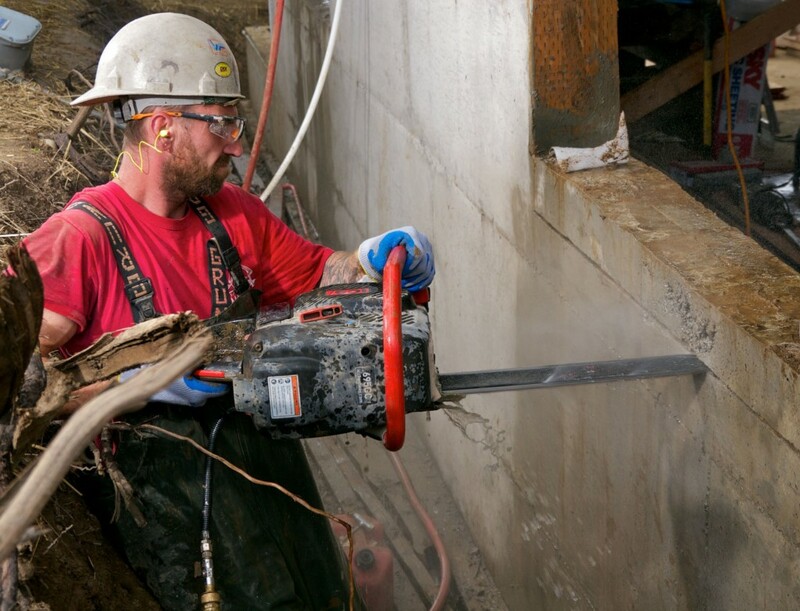 Our Chainsaws are ideal for sawing in tight areas through structural concrete for Electrical, plumbing and HVAC openings, or decorative concrete where overcuts would either damage the integrity, or destroy the aesthetics of, the finished product. To minimize over cut, our skilled technicians use special ring blades that are extremely proficient in cutting doors, windows, ventilation shafts, stairwells, piles, and foundations, plus many other finishing applications. Since this blade is driven from its periphery, not the center, it can cut up to 16” deep with just a 20” blade making this blade able to cut nearly as deep as its own diameter. To finish cutting corners that would be left irregular with other saws.